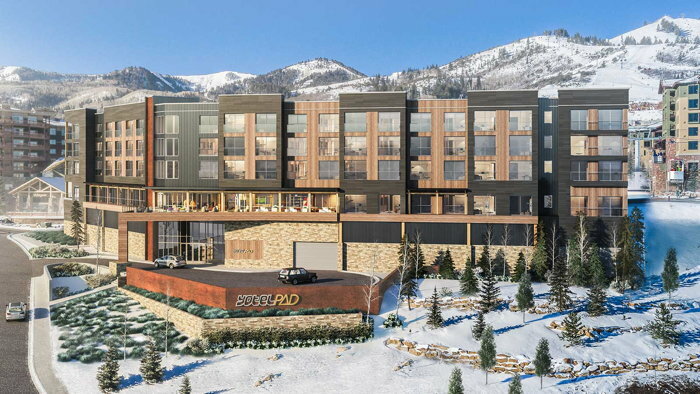 YOTELPAD Park City officially breaks ground in the Upper Canyon of the country’s largest ski resort, scheduled for completion in summer 2020. The development will consist of 144 PADs (condominiums) ranging from studios to three bedrooms and starting from $300,000, offering owners an affordable entry price that is not available anywhere else in the market. Each PAD is carefully planned and optimized for functionality with a flexible design and built-in technologies. Interior features will include multi-purpose Italian-made furniture, dynamic lighting, a smart TV and tech wall, comfortable work spaces and ample areas to relax, the YOTEL brand’s signature adjustable SmartBeds™, bathrooms featuring a monsoon rain shower, equipped kitchens with large view windows, and social spaces for all ages. Amenities will include a year-round pool deck, oriented to the west to maximize the afternoon sun, a large hot tub, fire pits, and outdoor living spaces on the Vista Terrace. The pool deck will adjoin a fully equipped fitness center and steam room. As an added benefit, ski and car valet service will be provided to owners and guests for the ultimate convenience and efficiency, maximizing time out on the mountain with family and friends. Additionally, the property allows owners and guests to efficiently store four-season toys—skis, boards, bikes and golf clubs—in strategically placed areas, making YOTELPAD Park City an optimal resort residence for those with an active lifestyle. Replay Destinations, one of the most innovative developers of destination resort projects, is spearheading this first YOTELPAD project in North America, bringing desirable resort living to those who aspire to owning a four-season vacation home in a prime village location. With a similar mountain setting and smart design, Replay Destinations is also overseeing YOTELPAD Mammoth, which will break ground this summer and open for residents and guests in winter 2020/2021. A third North America destination, YOTELPAD Miami, also broke ground this month and is slated to open in 2020. The YOTEL group is launching four more YOTELPADs outside of the U.S. with one in Dubai Business Bay and three around the Geneva Lake district, bringing the PAD key count to over 1,100. For the official groundbreaking ceremony located at the base of Park City Mountain in upper Canyons Village, representatives from Replay Destinations were joined by the teams from YOTEL, Berkshire Hathaway HomeServices Utah Properties, and TCFC. If you are a member of YOTEL you may be interested in learning how to optimize your content on our network.